On our first anniversary, I surprised my wife with a shadow box filled with reminders of our first few months of dating. I included items that brought back memories of those days: a matchbox from the sushi restaurant where we had our first date, an old photo of us taken at a friend’s party and several admission-ticket stubs from the museums we loved to walk around. But the best part is that I accidentally started a tradition. For the background of the shadow box, I had cut a page from a decorative scrapbook. Every anniversary since then we’ve added a photo or handwritten note to that scrapbook. It’s fun to do together and has been such an easy way to capture memories. Ready to create your own? Use these simple tips to start a shadow box—and a romantic anniversary tradition. Choose a shadow box that’s a few inches deep so you can include three-dimensional objects. Decorate the background with a page from a scrapbook. Use a color that will contrast with the items you want to include: this will make your display stand out. Arrange five or six mementos inside. A simple handmade cutout to represent your early days together—like a city skyline—adds a nice finishing touch. Make it a ritual. If you used a page from a scrapbook in your shadow box, you can decorate pages in the rest of the book on your anniversaries to come. Don’t stress about it. Just put your heads together and decide what made your past year so special. Each entry could be as simple as a photo in front of a new house, a pressed rose from a bouquet he sent, a label from a wine you shared at a fancy dinner or even a collection of romantic emails. Share the love. 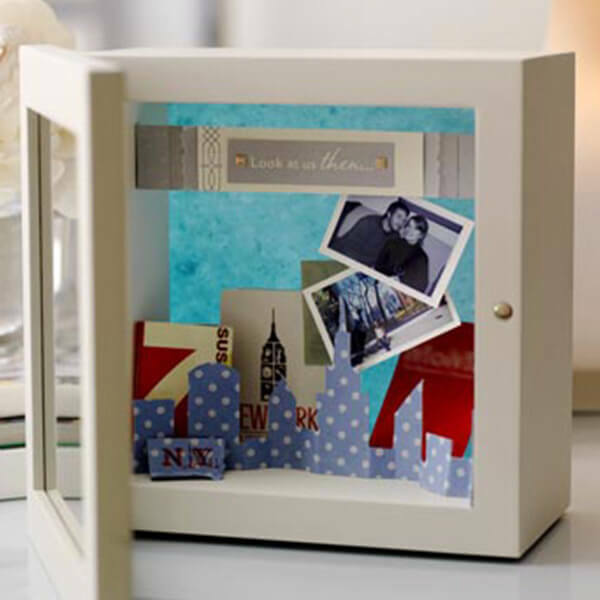 A shadow box makes a lovely wedding gift—especially when you include an invitation and favors from the big event. Give it with a scrapbook to get the newlyweds started on their own romantic anniversary tradition.